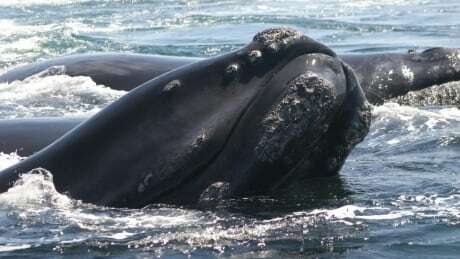 The federal fisheries minister met with fishermen, industry representatives and marine scientists Tuesday to discuss the impact of restrictions put in place to protect North Atlantic right whales and whether they may be needed for the coming fishing seasons. Jonathan Wilkinson sat down with dozens of stakeholders at a hotel in Dartmouth, N.S., to discuss measures introduced earlier this year that were aimed at shielding the marine mammals against fishing gear entanglements and ship strikes — their greatest threats. Wilkinson told the group that as a result of the initiatives in the Gulf of St. Lawrence, from being hit by a ship or getting snarled in fishing line. But, he said he understood that the extensive fishery closures came with an economic cost to those who make their living from the gulf's rich fishing grounds. "Some, including many in this room, told us that the 2018 measures went too far and we recognize very much that some of these measures have had a real and very difficult impact on livelihoods of many of your members," he said. The measures were introduced after — 12 of them in Canadian waters — prompting concerns that the population might be on the fast track toward extinction. Fishing areas were closed in the Gulf of St. Lawrence, speed limits were reduced for vessels and Fisheries increased surveillance of the area to look out for the whales. Wilkinson said he wanted to hear from the stakeholders about how to "strike the vital balance" between ensuring the critically endangered animals are protected, while maintaining lucrative fisheries. Members attending the half-day meeting included crab and lobster fishermen, fisheries unions, First Nations fishermen, provincial fisheries departments and researchers from Dalhousie University and the Canadian Wildlife Federation. Some fishermen in the region said the so-called dynamic and static closures were heavy-handed and unnecessary at times when the whales didn't appear to be in their fishing zones. But Wilkinson said the mitigation efforts also helped in negotiating the fisheries portion of the updated North American free trade pact, also known as the USMCA. "Our continuing ability to meet the requirements of the Marine Mammal [Protection Act] in the United States and thus to be able to continue to export freely to the U.S. will certainly be based on us achieving similar levels of success going forward," he said. Jocelyn Lubczuk, a spokesperson for the minister, said after the regional consultations and a scientific review process, Fisheries will brief the groups about the recommendations. The department "will then begin finalizing the measures that will help protect right whales in 2019," she said in an email.